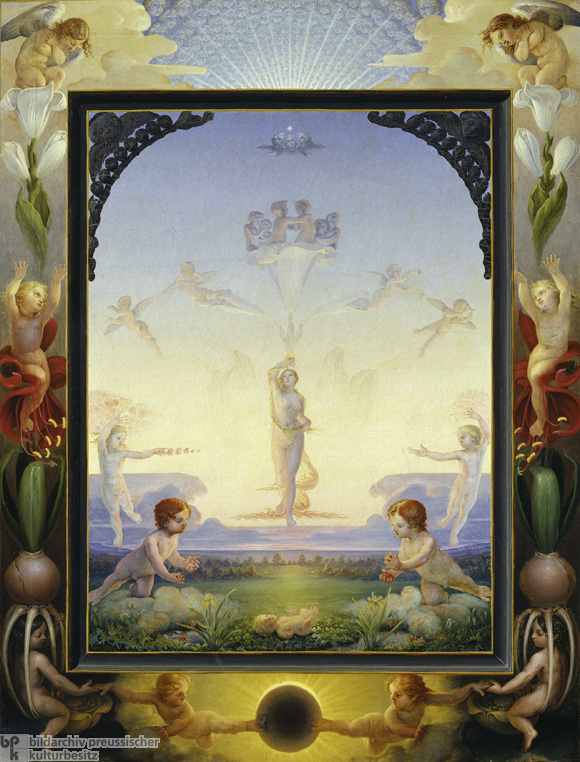 Philipp Otto Runge’s (1777-1810) Small Morning [Der kleine Morgen] – part of an incomplete four-part cycle called the Times of Day [Tageszeiten] – is perhaps the oddest and, at the same time, the most representative image of early Romanticism. Many early-nineteenth-century painters and writers had an intense interest in idealist and transcendental theories. From the writings of Johann Ludwig Tieck (1773-1853) and Novalis (1772-1801) to the paintings of Caspar David Friedrich, German Romantic art tried to put into practice the mystical belief that the natural, visible world contained hidden, spiritual meanings that could be unlocked in the higher consciousness of an artist and conveyed to an audience by means of a symbolic language. Like Friedrich, a fellow Pomeranian, Runge grew up in the northern Protestant tradition of pietist nature worship. In painting, this tradition could be traced at least as far back as Albrecht Dürer (1471-1528) and combined a rigorous study of nature with an intensely religious reverence for the beauty of landscape. The early Romantics, however, took this combination of naturalism and symbolism to an almost hieroglyphic extreme. In Small Morning, for instance, natural phenomena such as color and light are supposed to express the earthbound soul’s progress toward liberation. But as the fate of Runge’s own project demonstrates, such an intensely speculative and subjective foundation could not sustain an art movement for long. The complex and ambitious program of Runge’s planned cycle (related, like Novalis’ novel Heinrich von Ofterdingen, to the writings of the 17th-century mystic Jacob Böhme) was so abstract as to be virtually incomprehensible even to other Romantics. In the absolute uniqueness of his symbolic and visual vocabulary, Runge stands as the greatest exemplar of the paradoxical Romantic enterprise: the search for a universal form of communication through completely subjective means.